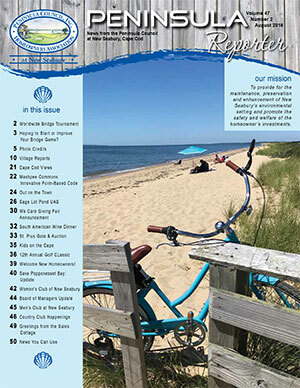 The Peninsula Council has provided the following News and Information for the residents of New Seabury. The Homeowners at New Seabury must continue to be vigilant……. coming soon! The ARC Guidelines & Specifications prohibit use of woodchips because they are not aesthetically pleasing; they are toxic and will kill grasses, plants, etc. The ARC Guidelines and Specifications prohibit the use of crushed shells because of the bright white color, damage to roads and drains and the use of crushed shells is more a Nantucket type design which does not fit within New Seabury. Maushop Village is the only village allowed to use crushed shells.